"I am a writer and in common with many other writers, I prefer the shadows to the limelight. Nevertheless, I believe this website will raise the curtain a little and answer some of the questions that arise about my work both before, during and after The Alan Parsons Project." Eric died of kidney cancer at the age of 64 in 2009 and in response to many requests, we have decided to set up a JustGiving fundraising page in his memory. All donations will be given to Cancer Research UK, which is the world's leading charity dedicated to beating cancer through research. 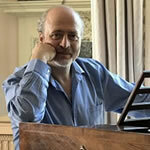 This official Eric Woolfson website has been created to provide information about the catalogue of recordings and theatrical works of award-winning composer, lyricist and writer Eric Woolfson. Eric was the creator, songwriter, lyricist (and often lead singer) of the ten Alan Parsons Project albums. Since then, he wrote five stage musicals (Dancing Shadows, POE, Gambler, Gaudi and Freudiana) which have been performed world-wide. Here you can find details about all these works including information about current musical productions and how to purchase tickets, mp3 audio clips, plus links to Eric Woolfson's Facebook Page and a Shop where you can purchase CDs and downloads.